Having an automatic pool cleaner can be a huge help during a busy summer. While you are running through activities, errands, and vacations, you can rest easy that dirt and debris is not collecting in your pool. If you’re considering buying an automatic cleaner, take a look at this overview of the different types to make sure you pick the right cleaner for your pool. A suction-side automatic pool cleaner is one of the most popular types of machines on the market. A suction-side cleaner attaches to either your existing skimmer or to a suction port and is activated whenever your pool pump is running. A suction-side cleaner moves around your pool, picking up dirt and debris and then relegates them to your filter system. 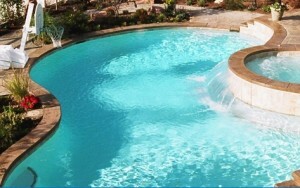 Suction-side automatic pool cleaners are usually the most economical choice and are easy to use. A pressure-side automatic pool cleaner attaches to the return cycle (or pressure side) of your pool’s circulation system. By attaching to the pressure side, this pool cleaner is pushed through your pool through the force of the water, picking up debris (which is put into a bag) and distributing clean filtered water throughout your pool. One of the big advantages to a pressure-side automatic pool cleaner is that because it has its own bag to store debris, it doesn’t clog up your filter. Pressure-side automatic pool filters are usually more expensive than suction-side cleaners, and are slightly more complicated to use. However, they have some great benefits, including the fact that they are faster and more efficient than a suction-side cleaner. The last of the automatic pool cleaner types is robotic or electronic cleaners. With the ever increasing technological advances, robotic automatic pool cleaners are becoming more and more popular. Like pressure-side cleaners, a robotic automatic pool cleaner has a bag or cartridge within the cleaner that stores all the dirt and debris that it picks up. A robotic pool cleaner require a 10-volt electrical supply (though a transformer inside the cleaner brings down the power), and steps up the cleaning of your pool by scrubbing, cleaning and vacuuming. It also acts as a secondary filter, which decreases the amount of work that is required of your normal filter. Robotic cleaners will automatically navigate your entire pool and are the quickest of all the automatic pool cleaners. Knowing the basics of automatic pool cleaners can help you pick the one that’s right for your pool. No matter what you pick, automatic cleaners can help you enjoy a stress-free summer. If you have questions about what kind of cleaner would be best for your pool, contact your local pool company for advice.